Last weekend I took my Module 2 exam, Honey bee products and forage. I think it went well! Until the last five minutes, anyway. I had been wondering how I’d managed to finish on time and why I wasn’t frantically scribbling away like usual. Then I looked back through the paper and realised I’d forgotten to answer two parts of one of the questions. So I asked for more paper and just about managed to scrawl down the answers in extremely sloppy handwriting. Apart from that I was very lucky with the questions, lots on flowers, pollination and the composition of nectar/honey. Felt sorry for any expert wax moulders, mead makers or honey producers doing the exam, who must have felt peeved at the lack of opportunities to demonstrate their knowledge. I was planning to wait till I got the results of Module 2 before deciding whether to do another exam, but as I’m hopeful that I’ve passed I’m going to crack on. It’s a big ‘un next, the one everyone says is tricky: Module 5, Honey bee Biology. The revising should keep me busy over winter, but there won’t be much Emma and I can do for our bees meanwhile. This weekend I put slabs of fondant over their crown boards (just in case, they have plenty of honey too). In December we’ll treat with oxalic acid. Then there’s a lull until March, when suddenly it hits us that we need to get busy making frames for the spring shook-swarms. And everything bursts into action again. 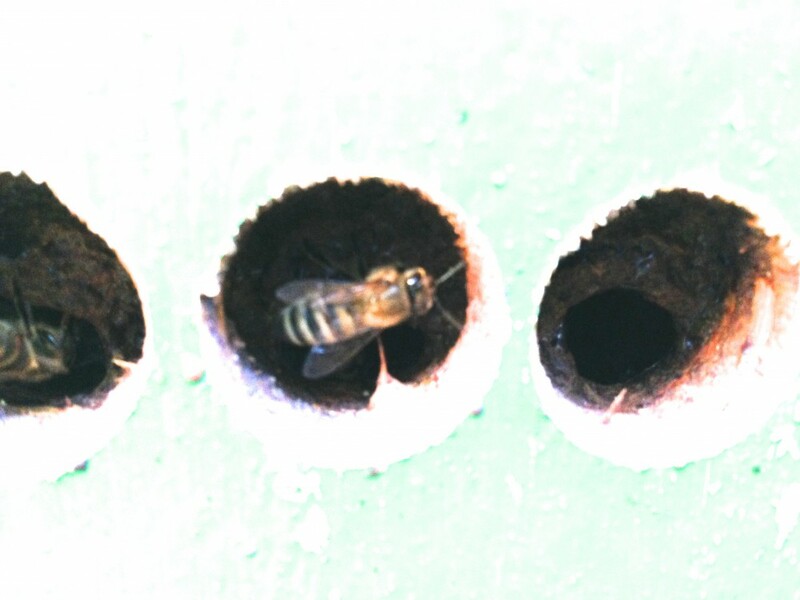 I was fascinated to see that Brian’s bees in their top bar-hive have reduced their entrance holes using propolis. Much easier to defend against wasps when the holes are this size and presumably warmer too. I wonder if the propolis would actually keep mice out. It does go firm in cold weather, but also quite brittle, so probably a mouse could bite through it? Terrible photos I know – light conditions were very low, but hopefully you can see that the propolis is dark brown and beyond that is the dark of the hive. 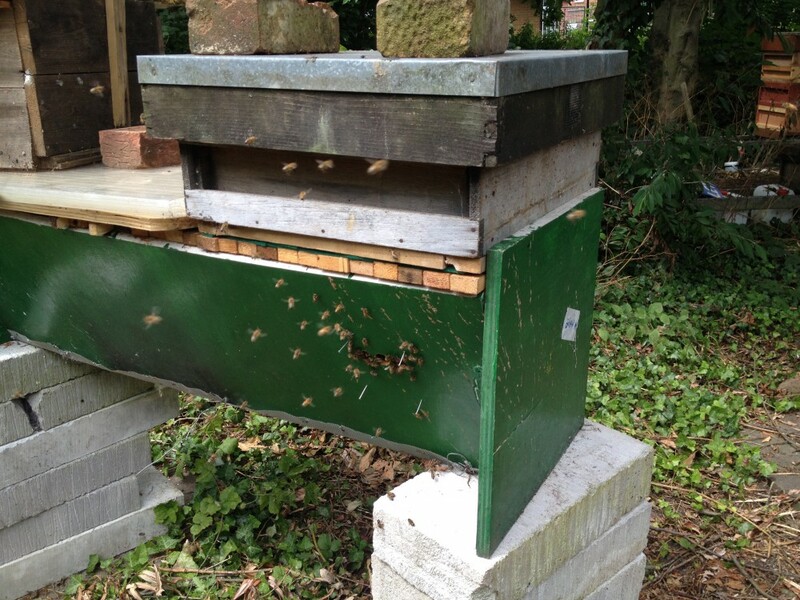 How are your bees doing, are they hunkering down for winter? This entry was posted in Bee biology, Exams and tagged propolis. Bookmark the permalink. Bees vary enormously in their use of propolis,some use very little but I have had colonies that produced a complete curtain right across a National hive entrance, leaving small holes for access. I suppose the name meaning “before the city” hints at this wall building trait. The way that it sticks to teeth and the strong antiseptic smell could well discourage fieldmice. You may well be right about the stickiness and smell putting mice off, I hadn’t thought of that! Must be nice to know the exam is over, and that you likely did well. Love the photos! You can see the propolis quite well. Do you know what size the entrance holes are in Brian’s hives? I’m curious. I did this once as an undergrad……never will forget it! Such a scary moment when you realise, isn’t it?! MIne sometimes make a propolis screen with a, defendable, one bee-way entrance in the wasp season, but not every year. 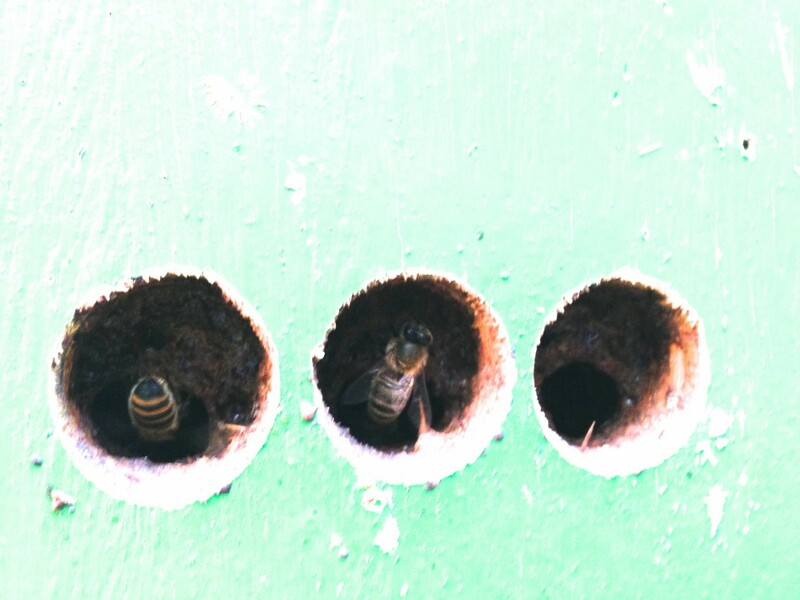 This year one of our colonies has covered over one of their crown board holes with comb, leaving only a small gap to get in and out. It’s fascinating to see how they modify their hives. Thanks Amelia. I’m planning to start doing biology revision posts soon 🙂 I think the mice are attracted by the warmth and cosiness of the hive as well as the honey, from their point of view it must seem like a dream home. Hope those bees can survive the curiosity of any passing mice. I know the bees will seal off the area between the supers, glueing them together with propolis, but have never seen them try to narrow the entrance before. Quite interesting.